Welcome back for week two of the One Room Challenge! I don't feel like we got much done this week, only because much of the progress that has happened can't be seen. We purchased our cabinets and backsplash, but didn't get to install the flooring like I had planned. After a lot of research on the subject, I had a strong suspicion that our original 1970's vinyl sheet flooring might contain asbestos, so to be extra safe we sent it off to a lab to be tested. We got the results back last night and we're all clear, so this means the old flooring gets ripped up this evening and we'll start tiling tomorrow! After we purchased our cabinets we were excited that we managed to fit them all in my car, but it meant there was nowhere left for Charlie to sit! I had him drive and was able to squeeze myself into a small space in the back. Luckily we didn't have to go too far! Last week I promised to share the finishes and accessories that we plan to use. Since it's such a small space I had originally planned to go with some funky, expensive tile, but ultimately decided that it wouldn't fit in with the updates we've already done to the rest of the house. I've decided to keep it consistent and use subway tile like we did in our kitchen and bath remodels. This flooring doesn't look like much online, but in real life it has a linen look and texture to it that makes it perfect to use in the laundry room. We plan to go check out countertops this weekend as well. I had planned to go with carrara marble, but there is a calacatta slab that I have my eye on, so stayed tuned for our decision! Hardware for the cabinetry is still up for debate, but you can see some styles that I'm eyeing on my One Room Challenge Pinterest board. I'm also still debating on whether I want to continue the subway tile along the wall behind the washer and dryer, or cut it off at the end of the cabinets. Since we're going with a cheaper tile I feel like this could make it feel a little more high end. Thoughts on this? Make sure to check out the rest of the One Room Challenge linking participants, and come back next week when we will hopefully have a completely transformed space. Our goal is to have flooring, baseboards, and cabinets in by next week, and don't forget you can follow along with our progress on Instagram! I say continue it on! Can't wait to see the end result! It's going to look great, looking forward to seeing it all done!! I'd vote for continuing the tile too! I love all your choices so far and can't wait to see which marble you end up with. I'm in agreement with others. I think continuing the tile on would be great, if it fits your budget. Good luck with the decision making. It's so hard to make so many choices. I think I asked more questions about moving forward vs. giving a great progress report this week. 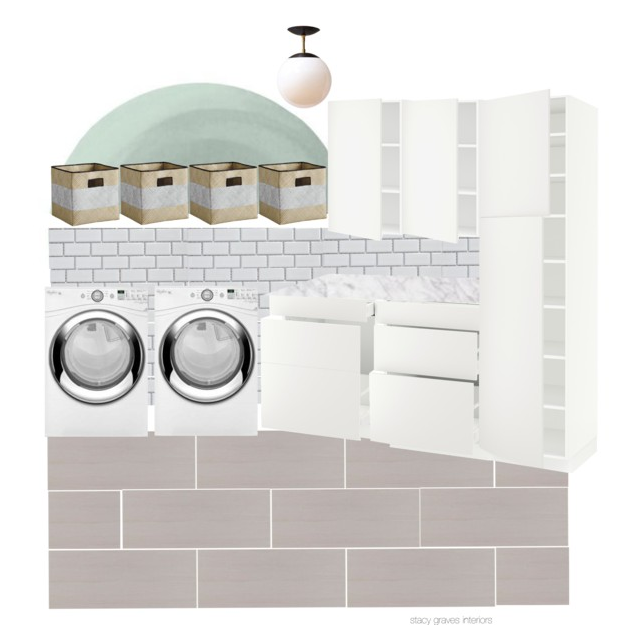 one room challenge - laundry room design plans!